A unique O’Keefe Challenge finishers medal. This amazing marathon course starts on the outskirts of Bendigo, and follows the historic O’Keefe Rail Trail to Heathcote. From the Bendigo Baptist Church in Junortoun on the outskirts of Bendigo, runners will pass through beautiful bushland, through the small townships of Axedale and Knowsley, cross the Campaspe River and along the banks of Lake Eppalock. Runners will reach their final destination in the heart of Heathcote at Barrack Reserve. 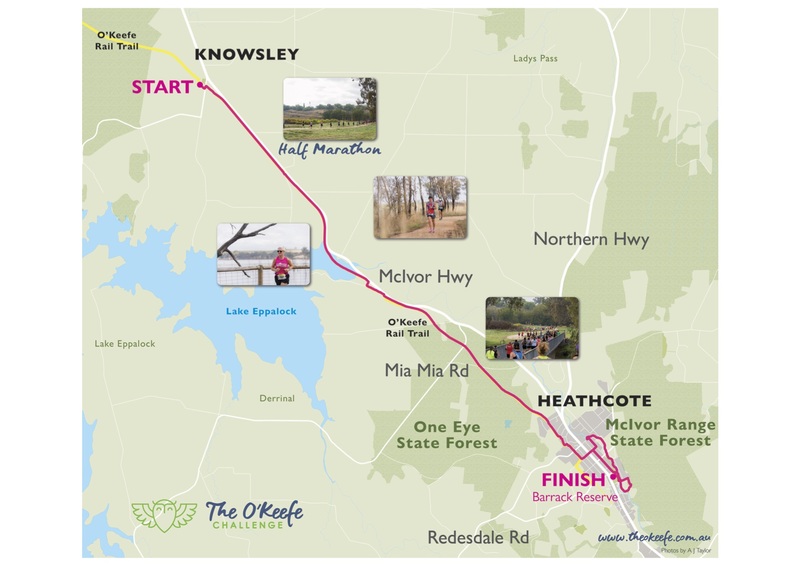 From Knowsley to the heart of Heathcote, this run follows the historic O’Keefe Rail Trail passing Lake Eppalock, open fields and dense bushland. It is a mostly flat route, so is accessible to everyone. The Athlete’s Foot Bendigo 10km offers those that enjoy runs of this classic distance a satisfying challenge on a NEW cross country course that will take in part of the McIvor Ranges. For the novice runner who has not competed off the bitumen in an event, it is a perfect event to become more accustomed to running away from the bitumen without it being too rough. We expect it will attract a few who enjoy ‘light trail running’ or find bitumen boring, too. The 5km Real Estate Run / Walk Against Dementia is a picturesque course starting and finishing at Barrack Reserve in the heart of Heathcote. Runners will take in some of Heathcote’s hidden gems in the Liquid Ambers and the McIvor Creek Trail. This is a low key event, similar in style to the popular parkrun phenomenon in that this also encourages the participation of the local community in promoting health, fitness and your wellbeing. Times are not as important. The aim is to finish and to support a great cause. All participants will receive a specially crafted ‘Forget Me Not’ (which is the symbol for dementia) medals of participation at the finish line. For the Sunday events, there is limited parking available close to Barrack Reserve at the event finish site. Nearby options include the Heathcote Primary School car park off Herriot St and also the Former Heathcote Railway station site, which is also on Herriot St and is the former O’Keefe Rail Trail Marathon finish location. These locations are a short 10 minute walk from the event finish site. Heathcote is approximately 1 hour 40 minutes or 135 kms north of Melbourne and 45 minutes east of Bendigo. DRIVE: From Melbourne, head for either the Hume Freeway to Kilmore or the Calder Freeway to Kyneton. From these towns take the turn-off towards Heathcote and enjoy a country drive past the paddocks, vineyards and hills to Heathcote. When will I receive my bibs? Bibs will be mailed out to participants to the postal address provided in the week commencing Monday 9 April 2018. Friday 20 April: Bendigo Athletics Track, 58 Retreat Rd, Flora Hill VIC 3550 between 4pm – 6pm. Saturday 21 April: Bendigo Athletics Track, 58 Retreat Rd, Flora Hill VIC 3550 between 2pm – 5pm. Sunday 22 April: Barrack Reserve Stadium, High St, Heathcote from 6:00am onwards. Marathon and Half Marathon entrants who cannot make one of the above collection times can collect their bibs from the ‘Baggage Drop’ located near start line at Junortoun and Knowsley respectively. What is The O’Keefe Challenge? The Marathon event was originally part of the Heathcote Community Games in 2015, but became a standalone event in 2016 with further cycling, walking and community activities added in 2017 and 2018. 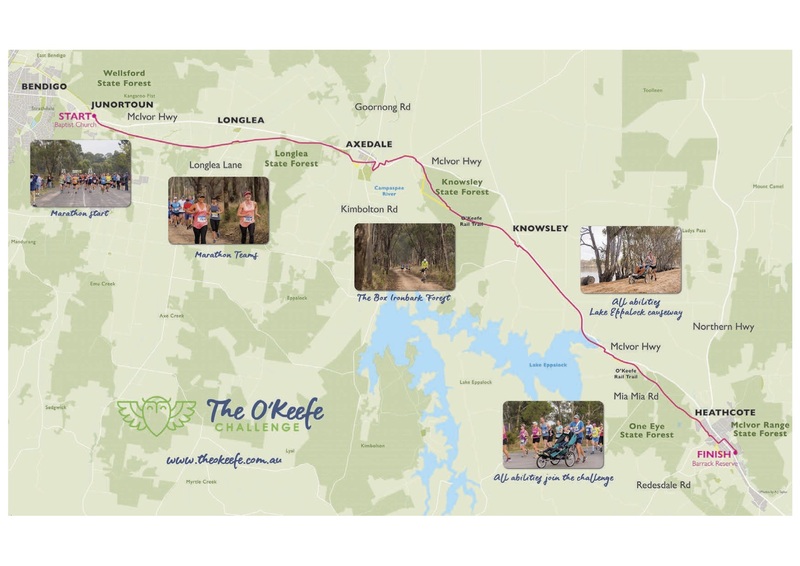 But the O’Keefe Challenge is more than just one race, there are running and walking events from the 42.2km Marathon down to a 500 metre dash, a social night ride, family scavenger bike ride, the Axedale Historic Walk and community activities, too. All of these activities are designed to celebrate fitness, nature and the community spirit of the Heathcote region. Where does the money from the O’Keefe Challenge go? Proceeds from entries are used to ensure a safe and well supported event; and the profit is donated to the proposed Heathcote Dementia Village Project. What is the connection with the Wenlock Olympian Games? The legacy of the O’Keefe Challenge’s inspiration is drawn from Dr. William Penny Brooks, the founder of the Wenlock Olympian Games and the inspiration for the Modern Olympic Games. Awarding of the prestigious Wenlock Olympian Medals to the Male & Female Marathon Champions. The O’Keefe Challenge is the only event outside of the England to have been granted the honour of presenting these prestigious medals. honouring the introduction of female athletes into sporting events. Apart from the running, cycling and walks, what other activities are happening on the day? There will be activities for the young and old on the oval at the finish line at Barrack Reserve. Join in the festivities including novelty races and events, temporary tattoos, Balloon Man, jumping castle and loads more. The area outside of the oval will be transformed into a Village Green, featuring a Kids Zone for the parents and their kids to take time out whilst they nibble on some of the local delicacies provided by the local schools. There will be a special event day market offering healthy food options and a chance to grab some bargains, plus a new wet area to enjoy a glass of Heathcote’s fine local wines and craft beers. Yes, a bag drop service will be managed by a team of volunteers at the Barrack Reserve building. Marathon and Half Marathon participants can also leave belongings with the event volunteers at their race start locations in Junortoun and Knowsley. We ask that you provide your own labelled plastic bag where practical. Are there toilets along the route/s? Yes! There will be some official toilets located along the route/s. There will also be toilets at the start and finish locations. When you’ve gotta go, you’ve gotta go. Where are the drink stations along the route? Yes. There will be drink and aid stations, manned by local volunteer groups, along all course routes and at the start and finish locations. These stations are situated roughly every 4km – 5km along the Marathon and Half Marathon course and approximately every 2.5km for the 10km and 5km courses. How was The O’Keefe Challenge?